Of all days, Valentine’s Day a nice guy and friend to many passed away, Jimmy Fregosi died of a stroke. Jim, whose nickname was “Froggie” which is another story in itself, passed away in Miami after being airlifted from the cruise ship where he was attending a cruise for fans and Major League Baseball Alumni. But to say the least Jim Fregosi treated me great when I was covering the Toronto Blue Jays for the Associated Press. Jim was hired by the Jays when he was an assistant with the San Francisco Giants and when then Jays GM Gord Ash called the Giants about talking to him the Giants said only if you are going to hire him. Well on March 17, 1999 after the Jays were 3-12 that spring under manager Tim Johnson, Jim arrived bright and early at Grant Field to take over the helm of the team. Back then I was a smoker and during Jim’s first full spring training (2000) I was able to get one up on the rest of the writers. You see Jim also smoked KOOLS like I do so while Jim was watching workouts I would wander by and he would immediately need a smoke. Most time we would just go off by ourselves and have a smoke but once he called me onto the field during BP at the Englebert Complex and chatted as we both walked down the right field line on field one. On that walk I ask just one question which as he finished his smoke he disappeared into the clubhouse for about 20-minutes. He then returned needing another smoke and we repeated the same exercise as I got the answer to my question. AP in New York knew I had something but they were told that I couldn’t send that till 9:30 PM which I did and blew all the other writers. Now here is a trivia question, what did Jim Fregosi do that Tim Johnson claimed to do but didn’t? Read on for the answer. When Jim’s contract was not renewed by the Jays in October 2000 despite a winning record for both seasons he was manager Gord Ash made a trip to Dunedin, took a hotel room and had Jim come over to receive the bad news. Well yours truly already talked to Jim before and after Gord left the Englebert Complex to tell him my cell phone kept lighting up with calls from news outlets. After waiting about an hour I called Jim at home and he gave me the bad news. I ask him what I should do about the news outlets calling me and he said wait 10-minutes then give AP my home number. That gave Jim time to bug out and go out his daughter’s soccer game. My quotes stood up. As a note here, because I wouldn’t give out Jim’s home number earlier I was threatened by just about everybody with termination, I do have a bit of ethical behavior in me. Now to the trivia answer and that is Jim Fregosi did go to Vietnam (USO Tour) while Tim Johnson said he went as a Marine but never left the states. I found out about the USO Tour during an interview in his office during spring training of 2000. Present during the interview with Jim was his buddy, bench coach and former GI Lee Elia. Elia was a teletype operator but never left the states. Jim talked about visiting a hospital in Cam Ron Bay, now if I remember correctly, it was in an isolation ward he was introduced to a pretty well shot up soldier and I can remember what Jim said what the kid said to him. “I hope you have a good season this year.” “He didn’t care about himself he was hopping I had a good season,” said Jim. The tape of this interview was erased as unless you were there in person or “Nam” you could never understand or fathom what was said or done. Now did you know that Jim was being looked at as the manager of the Giants when Barry Bonds was there. Now Barry and Jim did go to the same high school but things didn’t work out. Back in 1960 Jim got a culture shock coming from San Francisco to Ocala, Florida to attend his first spring training after being signed by the Red Sox. After being brought up in California the racism in the south got to him and throughout his life he was against it as far as I have known the man. Now in closing on this to all you Phillies fans. Remember in 1993 the Phillies went to the World Series and lost in six games to the Blue Jays. 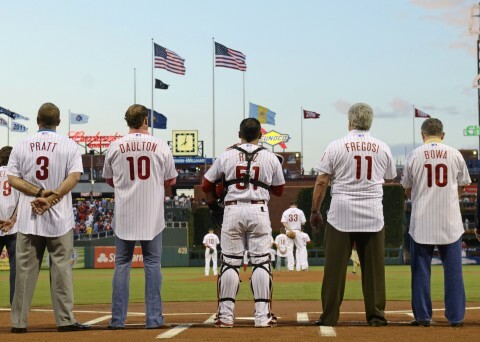 Well according to Jim and two other reliable sources Jim told the Phillie’s management after the series that the 93 squad was only a one year team, changes were needed. Well he was correct as the team’s front office wouldn’t make any changes so after the 96 season Jim was fired, taking the blame for others mistakes.